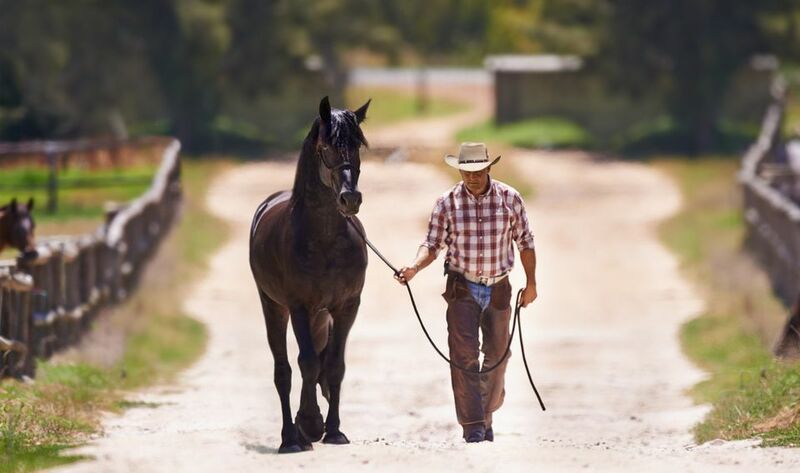 Clinton Anderson is a popular Australian-American horse trainer who is well known for creating the "Downunder Horsemanship Method" training philosophy. His books about his training methods have been featured in many equestrian magazine articles. He is a popular television and internet personality in the equestrian world, with a regular television show on RFD-TV, a digital cable and satellite channel. He frequently tours the U.S., speaking about his methods and promoting his various materials. Anderson tends to be popular with western riders. Anderson was born and raised in Cairns, Queensland, Australia. His family encouraged him to pursue his talent for horse training at a very early age. As a teenager, he apprenticed with renowned Australian clinician and horse trainer Gordon McKinlay and then Ian Frances, another nationally acclaimed Australian horse trainer. Following his Australian training, Clinton Anderson came to the United States as an intern with American reining trainer Al Dunning. In 1997, he moved to the U.S., where he now resides permanently. Anderson says he loved horses from the moment he first saw one—Lee, a Thoroughbred mare that his grandfather bought for his grandmother. As a boy, he looked forward to spending time on his grandparents' farm with the horse, learning how to care for and ride her. "She was my grandmother’s pride and joy," says Anderson. "I can still remember the first time I saw Lee and touched her nose—it was so velvety soft. My grandmother would put me and my sister up on Lee’s back and lead us around the pasture." He began his training business in 1998, touting the benefits of training based on mutual understanding and respect between horses and their owners, caretakers, and riders. Soon he took his knowledge on the road, holding instructional clinics throughout the U.S. and producing DVDs to help those who would rather learn at home. Three years later, he created a program for RFD-TV—"Downunder Horsemanship"—that showcased the use of his training methods. The show featured untrained horses who learned from Anderson's approach, and the show quickly garnered more viewers than any other on the network. Fox Sports Net followed suit, producing a 30-minute version of the popular show in 2011. Soon after that, DownunderHorsemanship.TV was created to allow free viewing of the show worldwide. Clinton remains active in equestrian circles as of 2018, hosting his internet-based TV show and holding training clinics around the U.S. He continues to create the training packages and tools that help him retain his spot among the country's top horse-training authorities. Anderson believes in the necessity of understanding horse physiology and the underlying psychology of why horses do what they do. Anderson's goal is to break training down into easy-to-understand steps so that horse owners can enjoy their horses as much as possible; his approach is known as the "Downunder Horsemanship Method." As part of his training philosophy, he developed his "Eight Steps to Success," with distinct levels and a step-by-step system for training. The levels feature simple instructions for both the horse and horse owner. Each lesson includes what you can expect your horse to do when given a specific exercise. Encouraging people to learn about caring for, training, and riding horses at young ages is a priority for Anderson. Inspired by his early exposure to horses, he maintains that young people and horses benefit mutually from learning about each other in ways that respect the psychology of each. The Clinton Anderson website offers a wide range of horse tack, equipment, books, DVDs, and more for sale. Many of the tools are available only on the website. For example, the Downunder Handy Stick is a training aid much like the carrot stick and is billed as "Clinton's #1 training tool." Additionally, the site sells DVD training kits, themed apparel, tickets to events and clinics, and membership in the "No Worries Club." Anderson has published a series of books that includes four titles. "Establishing Respect and Control for English and Western Riders" follows two riders—one English, one Western—through the process of learning and applying Anderson's methods. "Lessons Well Learned: Why My Method Works for Any Horse" takes a deep dive into Anderson's philosophy. "Philosophy Collector's Edtion" details Anderson's 20 years of experience in training horses and his psychology-based methods of training. "That Winning Attitude" offers quotes and writings that Anderson uses for inspiration and motivation. Anderson has a widely acknowledged reputation for being able to train horses previously labeled as untrainable. In 1997, he won the Australian National Reining Futurity, as well as the Road to the Horse Colt Starting Challenges in 2003 and 2005. "Stud horses are like teenage boys. Every once in a while you just gotta knock the **** out of them ... Every man watching this video right now knows when you’ve got a 15-, 16-year-old boy full of testosterone and he thinks he’s the king of the house, then every once in a while, you just gotta knock the **** out of them for 10 seconds to remind them there’s a pecking order in this deal. "Now the women who are watching this, you know, I make fun of these tree-hugging idiots that ride in a bitless bridle ... they trail ride, and they’re close to nature. They hear what I just said, and they say, 'That’s barbaric.' They’ve never trained a stud horse in their friggin’ life. And I wish they would, 'cause they’d get killed and that would get rid of most of these people who bug the **** out of me." Aside from the language and rantings in the video. Anderson also has been criticized for using heavy-handed methods that some feel are abusive to the horses he works with. Critics of his methods point out that he appears to be forcing his horses, rather than working with them. Overall, however, Anderson enjoys a positive reputation among equestrians. "Horsemanship should be fun. By learning how to control your horse in any situation, your confidence will greatly increase. When you're confident, you can relax and enjoy your partnership." "Be as gentle as possible but as firm as necessary."